When your hear the name P.T. Barnum, many of us think of the circus and the wonders it contains. But do you know anything about the man behind it all? You might after watching Hugh Jackman play P.T. 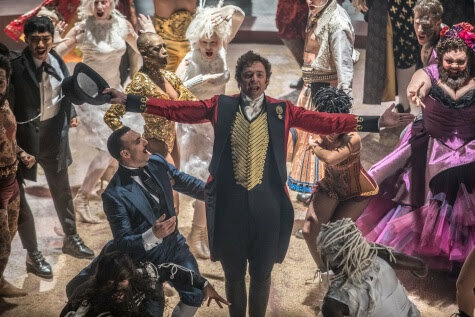 Barnum in THE GREATEST SHOWMAN, which releases in theaters December 20. 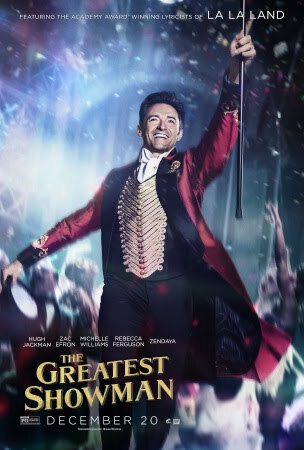 I attended an advance screening for THE GREATEST SHOWMAN film and was so impressed with everything from the acting, to the singing to the multiple storylines. After screening the movie, I had the chance to interview the cast and get a behind the scenes peek into the film. Hugh Jackman: So, this started in 2009, and I'd just hosted the Oscars. And the producer, Larry Mark, who's the producer of this, and Bill Condon, who directed the Oscars who wrote on this, came to me. At that point I hadn't done Les Mis. So, I'd done musicals on stage and I'd done movies, but I'd never done anything--a movie musical, and I was like, "Let's do it." And they had the idea of P.T. Barnum, which I thought was perfect for a musical. I do think when you have a character who's in the world of show biz, who's larger than life, it lends itself to a musical. So, in that way, I thought this is a perfect type of character. Zac Efron Some point in life, or at one time or another, I'm always wanting to do a musical. I think I'm like you (Hugh Jackman) in that respect. I’m always wondering, where can I find the next way to integrate music and that sort of song and dance side of me into my work. And where will it be effective. Where will it be useful? And in Hugh's portrayal of P.T. Barnum, I felt like it would be effective. It could work through--Phillip could be a conduit to help show the magic of what P.T. Barnum did as a showman. Hugh Jackman: I mean, some things come easily to me. But we did a lot of hat stuff, glass stuff, and I'm clumsy. And literally, I would put my hand there and--20 feet, the shot glass from you (Zac Efron) was always there. And you (Zac Efron) were at one point going, "I think you're pushing a little hard." Zac Efron Well, yes, at that point, it was fun to watch you (Hugh Jackman) figure it out, because you're dealing with catching a hat on your foot and then flicking it back to your head. I'm, like, just sitting there in awe for half the numbers. You've already completed all that. 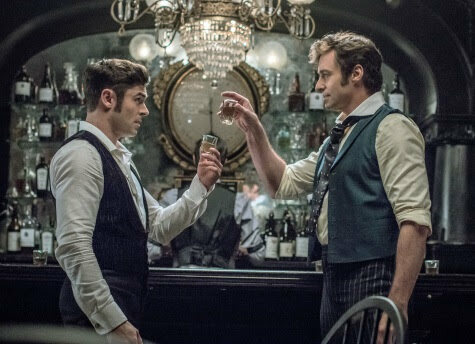 If I figured out how to slide a shot glass, you know, the least I could do is, you know, show you (Hugh Jackman) the finesse to it. Zac Efron It was really hard to do, actually, slide a shot glass full of liquid and keep it drinkable. Hugh Jackman: Right. Yes. But it was great fun. It's so much fun to do. Zendaya: Literally as much as we could do we wanted to do. I think that was the cool part about it, we kind of had the freedom to just go for it and just have some fun. And thankfully, I have a partner in crime who wanted to do it just as much as I did. Because when it comes to that, it's easy to get frustrated. It's easy to just say, "Oh, this hurts." Like, "I don't want to do this anymore," you know? But when you have someone that's like, "No, let's do it. We want that perfect take. We want to get it right," like, it makes for a better team. 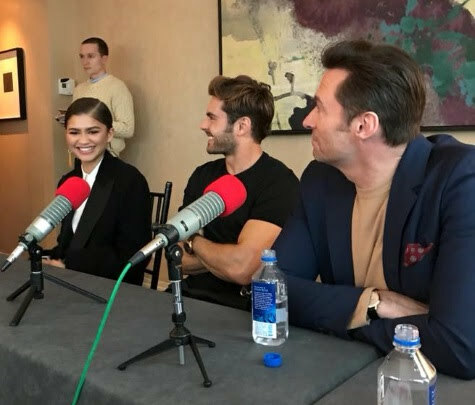 Zac Efron: That's a testament to Zendaya, because I didn't know what to expect coming into the rehearsal process. And, it's scary what we were doing, aerial work. There's no qualms about it. It's something I had never done. I had my own nerves about it. But on day one, she was totally committed. And once we kind of trusted one another, she just kept leveling it out. And I was like, "All right, let's go. Let's do this. Let's nail it." And that just made me that much more motivated to get it perfect. So, at the end of the numbers, we would often not want to quit. What they hope kids and families take away from The Greatest Showman. 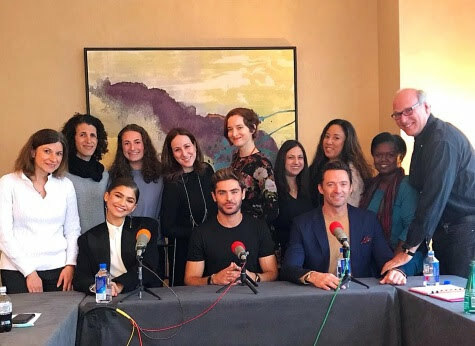 Hugh Jackman: Well, I definitely love the message of this movie, of accepting ourselves for who we are and what we love and the things that really make us feel passionate and not worry about what anyone else thinks. I have a 12 year old and I have a 17 year old, and I think anywhere probably from eight to 17, the pressure not only from peers but from advertising, from so many different sources is that there is a preconceived idea of what is cool, of what is good looking, of what is going to get you acceptance, that actually more than ever--and this movie is speaking to that, that actually being yourself is the coolest thing you can do. Zac Efron: Well, it's funny, because what he just put so eloquently is much harder for me to put into words 'cause I have less practice. And I guess I don't have my own kids or that perspective on it. But I've kind of been in the limelight and had it happen to me. What got me started on the path was what you (Hugh Jackman) just said. Being sort of free and comfortable with who I was. And I really resonated with the people that I met and worked with that were a little bit older than me in the Conservatory for the Arts. They were freethinkers and they knew cool things, and it was different. Zac Efron: It was kind of my own little world that I found in theater. And that's what put me on the path to do High School Musical. So, what you (Hugh Jackman) just said I think is really, really important, remembering to be confident in who you are is the hardest message to get across and such an easy thing to say. But I wake up and every day start with the man in the mirror, and just have to accept that and be excited about that--And grateful for that. Zendaya: I guess as a millennial, or someone that young people look to, it's a lot of responsibility. And I try to take it that way. Some people like to look at it as a pressure and a negative thing, and I think it's positive thing. It means 40 million people that I can positively affect, you know? And I think what my message is and what aligns with this movie is, it's not telling you to be a certain way, right? We're not saying this is how you should be. It's saying we want you to be the best version of yourself. So, nobody's saying I want you to be just like Zendaya. No, I don't want you to be just like me. I want you to be just like you. Zendaya: And that path looks different for every single person in any walk of life. I call it the butterfly effect, right? Everybody has that at any point in their life and it's constantly changing, cause we're human beings. We're all still learning and growing as we go. And I think that that's the beauty about what we do, is we get to kind of get stuck in a certain time period of our life where we can continue to be imaginative, because there's a time where, it's not cool to make believe any more. But that's what we do for a living. And it's fun and it's exciting.